This kit contains by far the best paper airplanes you have ever seen! These 12 incredible paper planes are easy to build-you simply pop-out the paper parts, fold where indicated, and staple them. Then the fun starts! This kit includes a strong rubber band catapult to launch the planes straight up, clear above the trees-from where they glide gracefully back down to earth. Unlike other planes that take a long time to figure out, these take under a minute to assemble, with no messy glue or tape required! A full-color book provides clear step-by-step instructions for each model and provides tips on how to fine-tune the airplanes to get the best possible performance. Andrew Dewar's ingenious airplane designs-made with special paper and designed for perfect weight distribution and long-lasting flights-allow you to spend your time flying these planes rather than making them. Head right outdoors with this entire collection for hours of high-flying fun! Andrew Dewar was born in Toronto, Ontario, and graduated from Ryerson Polytechnic Institute (B.A. Journalism) and University of Toronto (M.A. Japanese Studies, Library and Information Science) before moving to Japan in 1988. After completing his doctoral studies in library science at Keio University, he joined the faculty of a junior college in Japan. Soon after arriving in Japan he rediscovered his childhood love of designing and flying paper airplanes, after renewing contact with Yasuaki Ninomiya (creator of WhiteWings), with whom he had corresponded as a child. His passion for paper airplanes led him to become president of the Fukushima Paper Airplane Club. Dewar's first book was published in 1998, in Japanese. 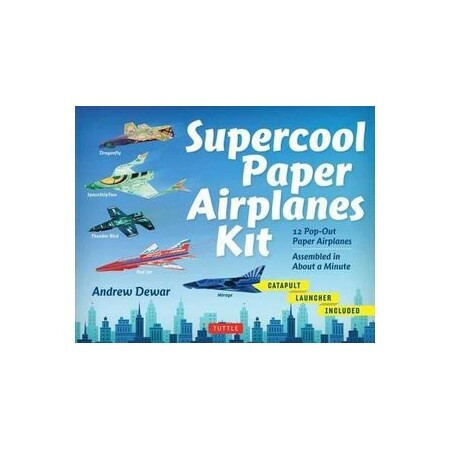 To date he has published almost 30 books, half in Japanese and half in English, including Simple Origami Airplanes Kit, High-Performance Paper Airplanes Kit, One Minute Paper Airplanes Kit, Ultimate Paper Airplanes for Kids and many other paper crafting books and kits. His interests have expanded beyond paper airplanes to other forms of paper engineering including origami, karakuri toys that move in interesting ways, a planetarium, working astronomical instruments, dinosaurs, and much more. He also teaches paper airplane workshops and does seminars at schools, libraries, community centers, and museums, for people of all ages: children, families, and seniors. He lived and taught library science in Fukushima, Japan, until the giant earthquake and nuclear accident in March 2011, when the city became unsafe. After a brief stay in Canada, he's returned with his family to Gifu, Japan.